The majority of Americans consume too much salt on a regular basis and are at risk of adverse health consequences as a result. Although there is some controversy over whether reducing our salt intake will have any benefit in terms of risk reduction for lifestyle diseases, government guidelines still suggest that we consume between 1,100 and 3,300 mg of sodium per day, which is vastly lower than the average adult Americans intake of 2,500 to 5,000mg daily. Is too much salt bad? High salt intake has been associated with increased risk of high blood pressure, and therefore increased risk of heart disease and stroke in a number of studies over the years. However, more recent evidence suggests that this link may not be as strong as once thought, with some studies suggesting that lowering salt intake only caused a small reduction in blood pressure in people who had normal blood pressure to start with. However, in those with high blood pressure or other conditions such as renal disease, and in people classified as salt sensitive, reducing salt intake was found to have a much larger effect. It is therefore unclear as to whether it is necessary or beneficial for the whole population to be reducing salt intake, or only those who are at high risk. Due to the small effect on blood pressure in the general population and the possibility that high salt consumption may have negative effects on organs in the body in all individuals, guidelines still recommend that we reduce our intake. In addition to this, the addictive nature of salt and the poor nutritional quality of many foods that are high in salt mean that there is probably no harm in reducing our salt intake. Eliminating many high salt foods from our diets is a good way to improve the nutritional quality of what we eat and cut calories and fat from our diet at the same time. See also: How much fat should I eat? Adding salt from a shaker during cooking and at the table does contribute to our daily salt intake, but in reality it is the hidden salt that is more dangerous as we are not aware of how much we are consuming. Most processed foods are high in salt, as are staple foods such as bread, cheese, canned fish, condiments, pickles and smoked foods. Many of these foods taste salty and it comes as no surprise that they have a high salt content, however, salt can also be found in sweet foods where you would not necessarily expect it such as breakfast cereals or cakes. Fresh fruit, vegetables, lean meat, poultry and fish are all much lower in sodium that canned, pre-cooked or processed varieties. Avoid very high salt meats such as bacon, salami where possible, as well as high salty snack foods such as potato chips, salted nuts and popcorn. See also: Is bacon bad for your health? By cooking your own meals rather than relying on ready-meals, fast food or restaurant meals you can easily reduce your salt intake. When you are cooking you are in control of how much salt is added and use other flavors to enhance taste rather than salt. Avoid adding salt to cooking or at the table where possible. Replace salt shakers on the table with a pepper grinder for flavor. 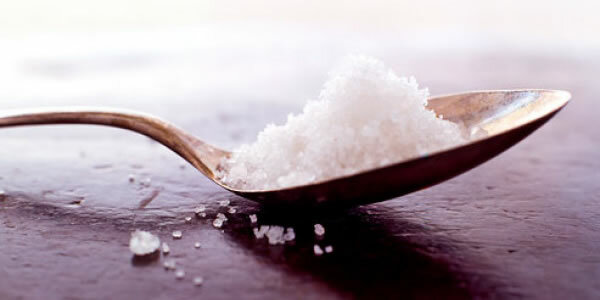 Reducing the amount of salt you add gradually is a good way to let your taste buds adapt. There are a huge variety of low and reduced sodium products available, so take advantage of these products where possible. In most cases, the difference is not obvious, especially after you have eaten the food a few times and have got used to slightly different taste. In some foods such as cheese, the flavor of low salt varieties can be quite different, so you may choose to use smaller quantities of normal versions. Foods such as bread, cheese, ready meals and many processed foods vary a lot between brands and type in terms of sodium content, so the best way to choose the lowest is to read the labels and compare products. A food can be considered high salt if it has more than 1.5g or 0.6g of sodium per 100g of product and low salt if it is less than 0.3g salt or 0.1g of sodium per 100g. Using herbs, spices, pepper, vinegar, lemon juice and garlic to flavor dishes instead of salt means that you do not lose out on the taste of the food and is a good way to prevent meals tasting bland when salt is reduced or omitted. Experiment with different spices and herbs from around the world and discover new and exciting flavors to stimulate your taste buds. Canned foods are generally high in salt as this is part of the preserving process. By rinsing vegetables or beans in fresh water before cooking them you can eliminate a lot of the salt. Frozen vegetables rely on low temperatures for preservation, so it is generally not necessary to add salt as well. This makes them a more desirable alternative to canned veggies when fresh produce is not available. Canned fish can also be a very high salt food, so to if fresh is not a viable alternative, choose those canned in oil or water rather than brine and drain well. MSG or monosodium glutamate is a type of salt that is commonly used as a flavor enhancer in processed or restaurant food and is particularly common in Asian cooking. Although some people have adverse reactions to it, for most people MSG is no worse than normal salt, although like normal salt, intake should be limited. Try to avoid MSG by reading labels or asking at restaurants to see if it is being used in cooking. Condiments often pack a large amount of salt into a small amount of product and although we do not eat large quantities of these foods, they can quickly add up to bump up our salt intake. Soy, fish and other Asian sauces, ketchup, spicy sauces, pickles and even mayonnaise generally have a high salt content to preserve them and to add flavor. Compare brands to find those lower in salt or choose low salt versions to avoid this, or simply limit your intake of these types of foods.